The Virgo and LIGO detectors have just started the new Observing run called O3, lasting a whole year. The hunt for gravitational waves begun on April 1st when the European Virgo detector, based in Italy at the European Gravitational Observatory (EGO), and the LIGO twin detectors, located in the state of Washington and Louisiana (USA), started to take data becoming together the most sensitive gravitational wave observatory to date. During a one-year period the LIGO and Virgo Collaborations will register science data continuously, and the three detectors will operate as a global observatory. The scientific output of O3 is expected to be tremendous and it will potentially reveal new exciting signals coming form new sources such as the merger of mixed binaries made by a black hole and a neutron star. The O3 run will also target long lasting gravitational waves produced for instance by spinning neutron stars which are not symmetric with respect to their axis. Furthermore, signals for the merger of binary black holes are expected to become quite common, perhaps up to one per week. Scientists also expect to observe several binary neutron star mergers. Since August 2017 both LIGO and Virgo have been updated and tested. In particular Virgo has fully replaced the steel wires which were used in O2 to suspend the four main mirrors of the 3 km long interferometer : the mirrors are now suspended with thin fused-silica (‘glass’) fibres, a procedure which has allowed to increase the sensitivity in the low-medium frequency region, and has a dramatic impact in the capabilities to detect mergers of compact binary systems. A second major upgrade was the installation of a more powerful laser source, which improves the sensitivity at high frequencies. 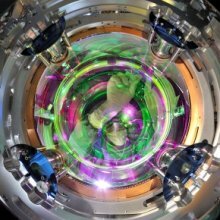 Last but not least squeezed vacuum states are now injected into Advanced Virgo, thanks to a collaboration with the Albert Einstein Institute in Hannover, Germany. This technique takes advantage of the quantum nature of light and improves the sensitivity at high frequencies. The LAPP group has been strongly involved in the preparation of O3 with detector improvements and data analysis. The adventure will continue after O3 as the physicists, engineers and technicians are already preparing the next detector improvements to be installed after O3 in view of the next observing run.